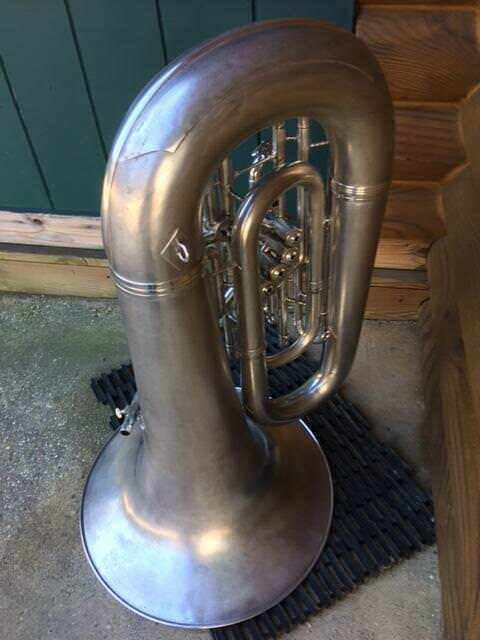 This is a tuba that I restored and enhanced - over a quarter of a century ago - for myself. 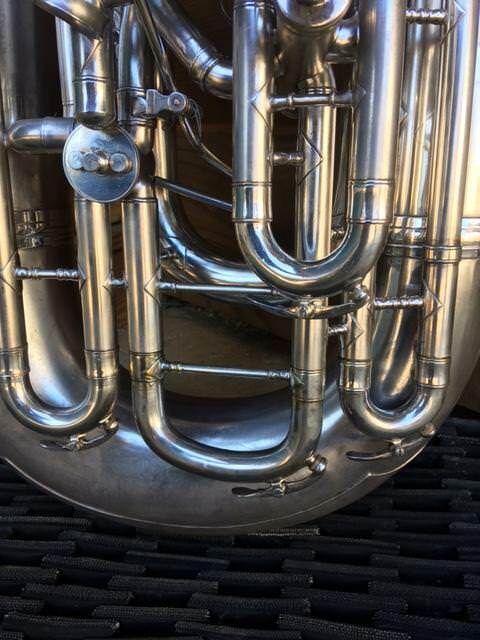 In a few short months, this tuba will celebrate its' 100th birthday. I later sold it (reluctantly: simply couldn't ignore the offer), bought it back, and - now that I've "gone to the compensating dark side" - have decided to sell it. 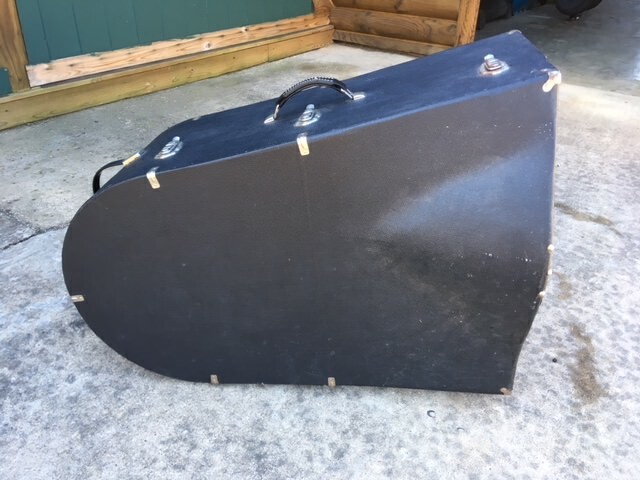 As some know here, I do not accept "project jobs" from others, only take them on for myself, and only choose instruments to restore/enhance for myself that display remarkably fine playing characteristics and intonation. Such is the case with this instrument. The intonation is excellent, the resonance quality is "York 19-1/2-inch bell amazing", the slurring is buttery, and EVERY slide is precision-aligned (as if every slide were a "first valve slide")...so if the new owner encounters some minor intonation quirk that they cannot overcome by minor "favoring", any slide could be "trigger-activated" without having to first align it. Please note that I added no such triggers for my own use. Also, please notice how much thought and painstaking work went into this instrument. 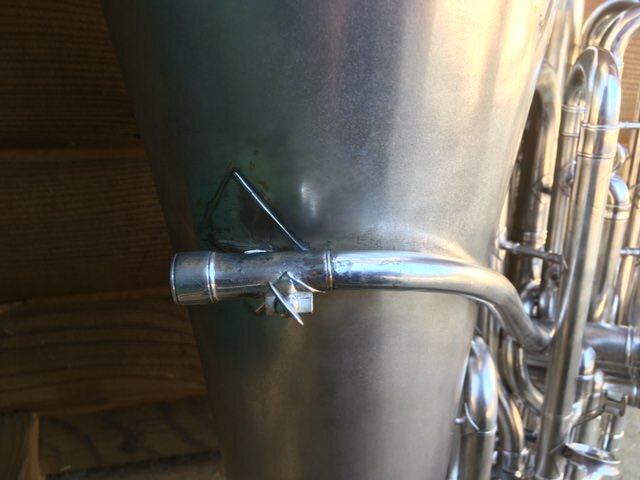 I would like to draw your attention to the three-dimensional crook that I manufactured for the 5th valve slide loop, which tucks that loop into the instrument and gets it out of the way of the player's right arm. 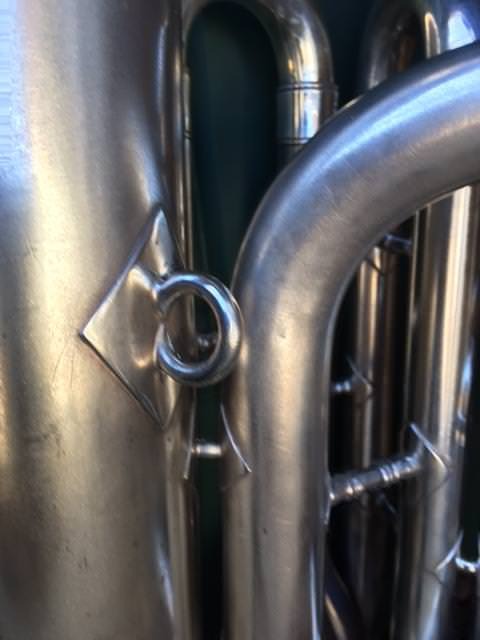 As another feature, please notice the two mother-of-pearl rollers on the 5th valve thumb lever, which prevents the lever from having to "scoot" across the thumb as it is depressed. Further, the 5th lever stroke is about the same as the piston strokes, which promotes smooth slurring and reliable "timing". 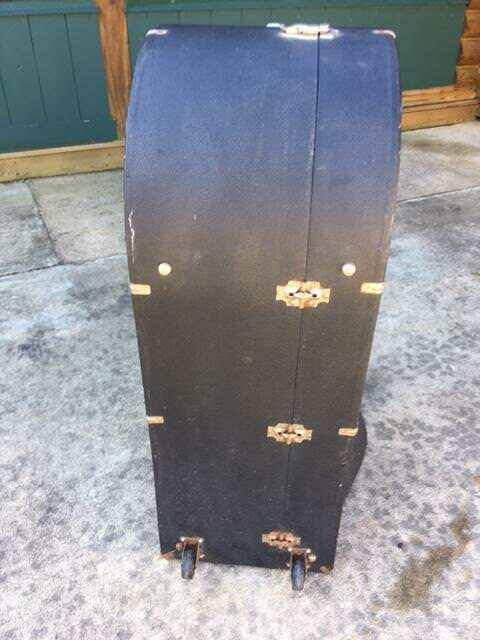 Also, please notice the location of the two heavy-duty strap rings and the lyre holder. I carefully located all three of those things so that they are actually very functional and (at least, for me) are perfectly positioned for "stand-up" quintet, jazz band, or solo playing. Needless to say, the pistons and casings (no pictures) are in perfect condition, sport very close tolerances, and feature nicely-fit brass guides. I did ~not~ "buff the crap out of" this instrument. 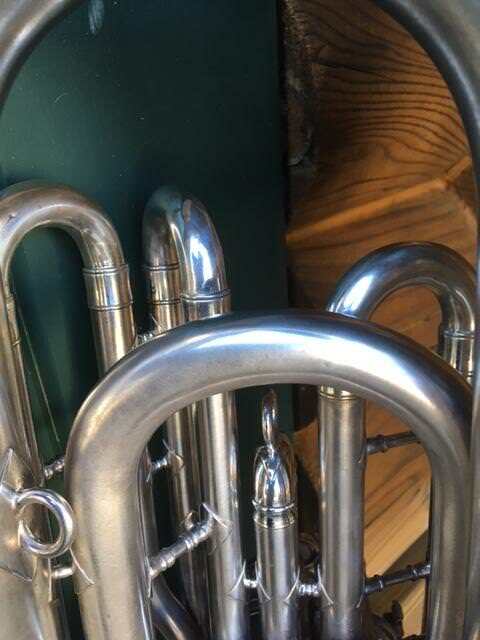 There bright silver bell interior sports typical tiny "dots" (due, simply, to environmental exposure) that one would encounter with an instrument that is between 70 and 100 years old. If extremely closely scrutinized, tiny imperfections are evident (very minor denting occurred during the time that I did not own it), and those are places that I have addressed to the very best of my ability without marking up the finish. 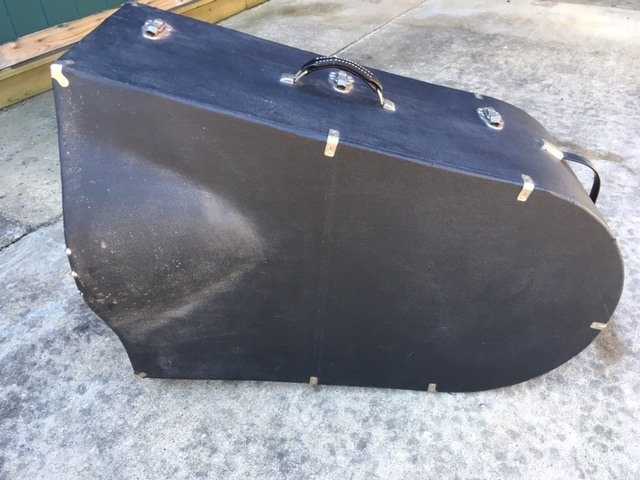 The bore size is the original, which is 21/32" (an indicated .656", which is the same as was later used on Olds O-99, Reynolds TB-10, Conn Abilene low-number-J BBb and C instruments, and the Bach-Elkhart BBb tubas). The large-side-of-the-tuning-slide 5th valve bore is 18mm (.708" bore), and the 5th rotor is vented. The bell diameter (again) is 19-1/2". Yes, the mouthpipe tube is original and in excellent condition. There is a custom-made GWW wood case that is in superb condition and features two wheels. 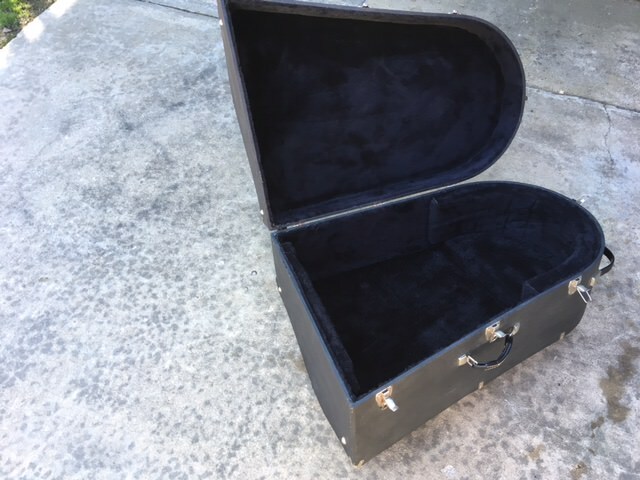 Not shown in the case pictures is a black upholstered curved piece (resembles a very large half-block of round cheese) which prevents the bell rim from coming in contact with the bell end of the case. 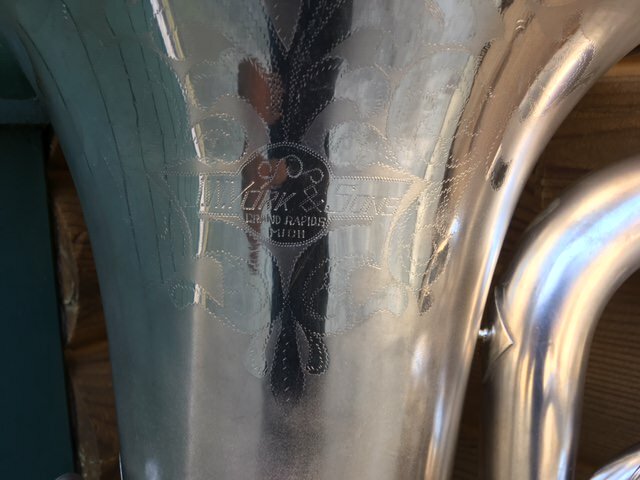 An offer of $7000 would buy it immediately, with that asking price - a Sellmansberger Imperial mouthpiece (with buyer's choice of standard/small shank and buyer's choice of rim) would be included, and I am willing to consider any offer that an interested party deems reasonable. I am incapable of being "insulted", but (please understand) offers below what I would consider will receive no response (but again, no hard feelings). I would (well, obviously) welcome a "bidding war", but do not anticipate one. 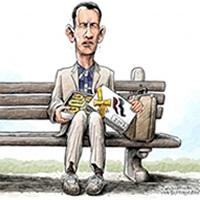 If one occurs, please trust my integrity, that I will not be "playing" a single bidder, and will absolutely not falsely pretend that there is another/other bidder-or-bidders. USPS money order, a personal check, or credit card will be acceptable for payment. As I would only consider a trade were it tremendously to a buyer's disadvantage, please do not offer any "trades". 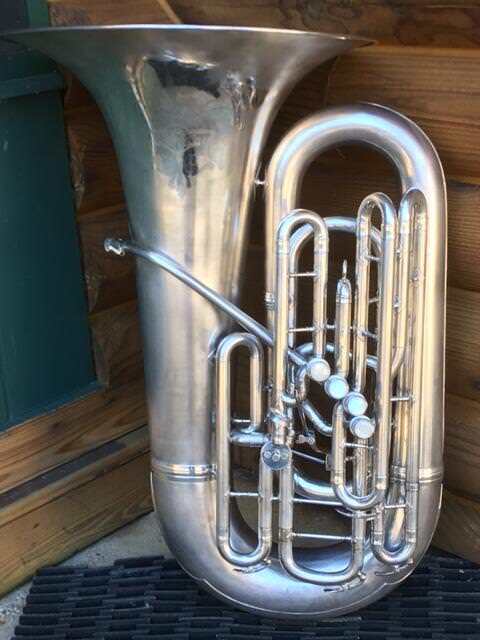 Please (simply) SELL your trade, and then pay for this tuba with money. I'm willing to answer any questions not addressed in this description. 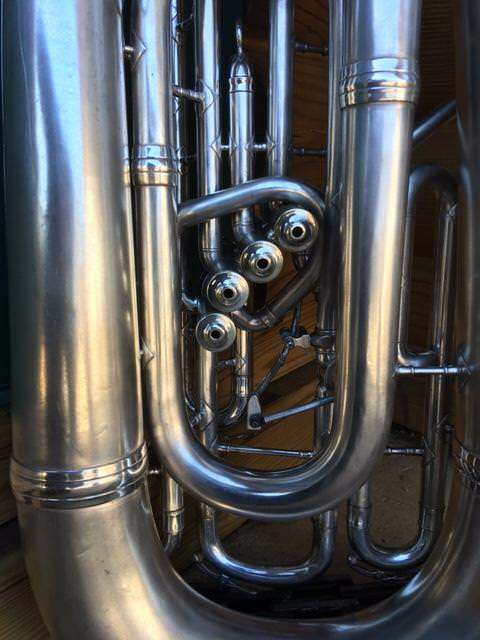 NOTE: Mrs. bloke REALLY likes this tuba. Shipping is to be paid for by the buyer, and - (IMPORTANT) once in the hands of a shipper OK'ed by the buyer - the instrument becomes the property of the buyer, regardless of any attitude taken by a shipping company. Last edited by bloke on Sat Jan 27, 2018 3:11 pm, edited 1 time in total. Dammit. Where did I put my gloves? 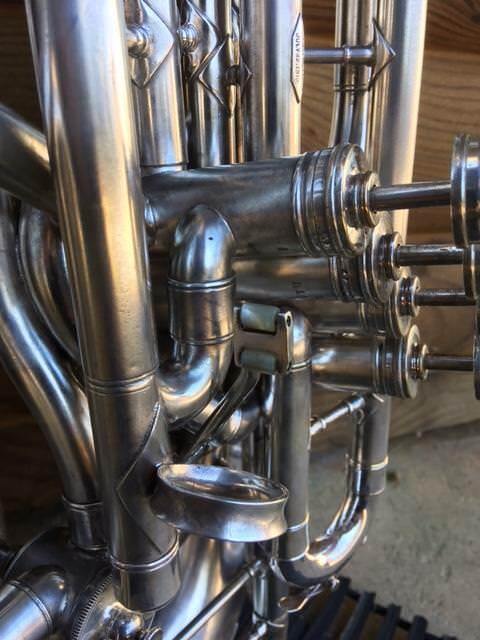 "Stunning" and "superb" don't even seem to do this horn justice! That horn is just plain gorgeous bloke! Three Valves wrote: What is its name?? 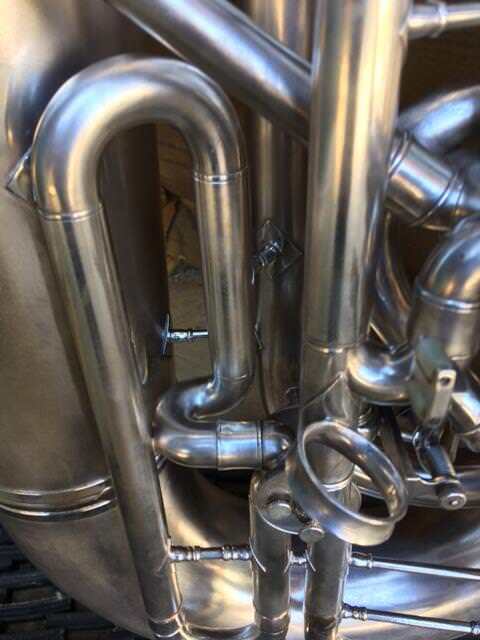 When marketing tubas of your own design, you need a "clever theme". As an example, someone with a name that directs one towards a certain theme has models of their design named "Kodiak" and "Ursus". For me (again, following the same type of theme), I believe the name, "Fatso", would be really cute and appropriate. Last edited by bloke on Wed Jan 24, 2018 8:17 pm, edited 1 time in total. 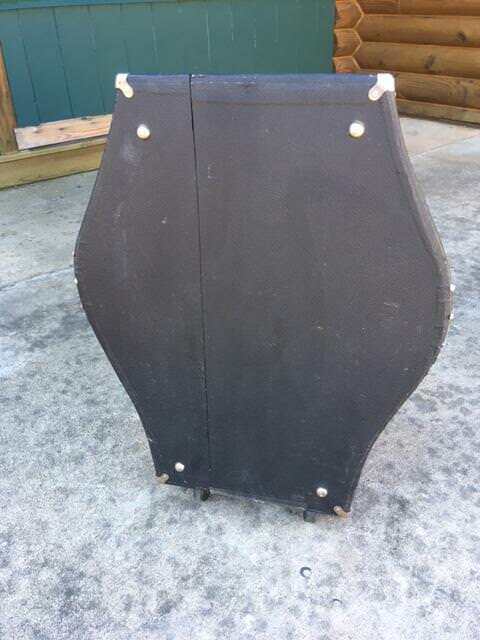 What's the low register like on this tuba. Most of the Eb's of that era have less than spectacular response below Ab. 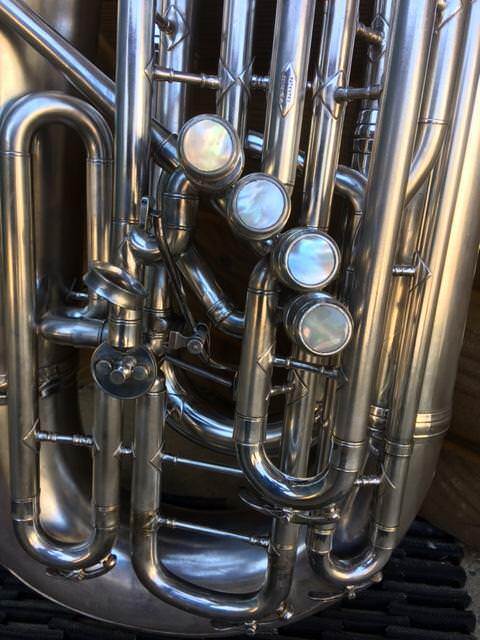 Alex C wrote: What's the low register like on this tuba. Most of the Eb's of that era have less than spectacular response below Ab. but I'm not going to re-do it. 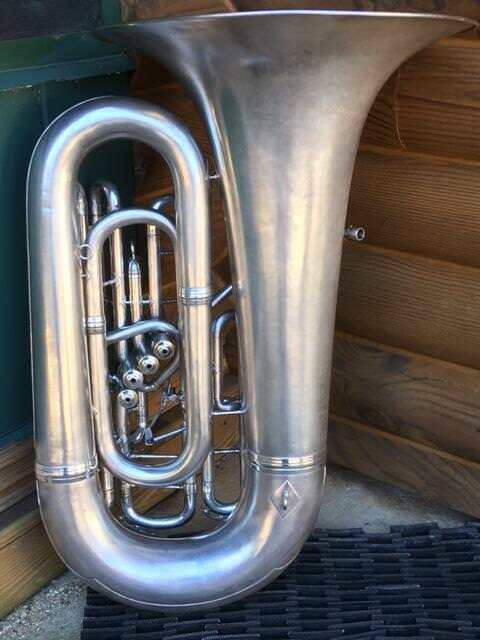 It sounds about like I haven't played an Eb tuba since the last boat job in November , but it's easy to play. I decided to do the most difficult thing (which is to descend without tonguing each pitch, rather than attacking each pitch individually). If you would like another video with me barking out each of those pitches individually, I'm willing. Last edited by bloke on Thu Jan 25, 2018 11:15 am, edited 1 time in total. 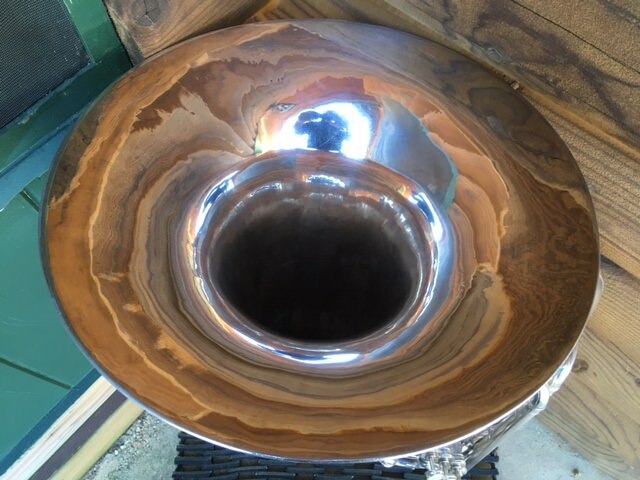 Ever since I heard/read about this horn, I've wanted to have a better look at it. Thank you. Incredibly well put together/worked out. 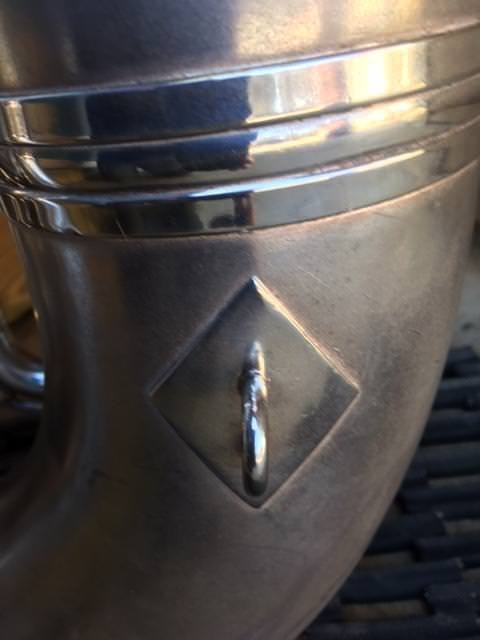 Owning a Holton that has the same past owner as your York, I know he chose really 'choice' horns. Hmmm, how much of a buyer's disadvantage did you say would be required? Yeah, it looks okay, I guess. Here are the url's of the pictures. Such a beautiful looking instrument. I've been lusting for one of these large Eb's for a while. Guess a few lottery tickets are in order Good luck with the sale! What a sound! - even across little speakers at my computer. barry grrr-ero wrote: What a sound! - even across little speakers at my computer. 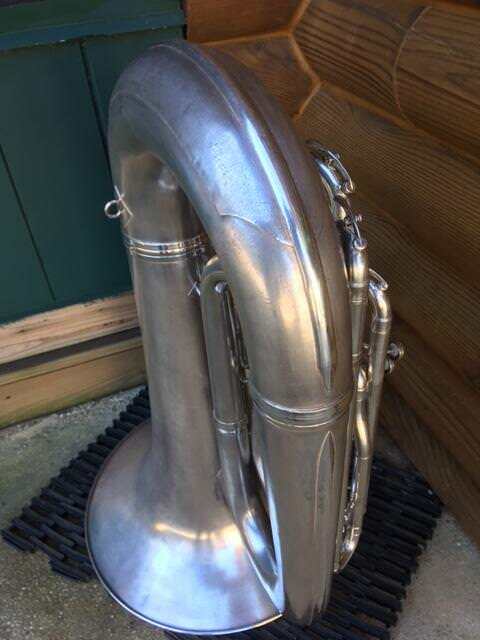 As Alex suggested, that range is not "the most amazing thing" about this tuba, but if the player "gives the tuba what it needs" (previous posts by me in various discussions - though I'm no teacher, and certainly not a professor) it works just fine... Just don't blow into it the same way you would blow into a Rudy 5/4, M-W 2165, or a Conn 20K sousaphone, and it's great...again: It's a .656" bore tuba. You might still be able to play it...Just stay on I-95, and don't get off at D.C.